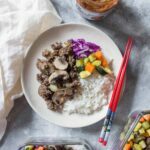 Skip the Korean take out and make these Bulgogi Korean Beef Bowls at home instead! Perfect as a weeknight dinner or as a meal prep! In a large bowl, combine soy sauce, brown sugar, mirin, grated onion, minced gralic, and black pepper. Mix to combine then add your ground beef to the bowl and mix it together. Set it aside in the fridge for 30 minutes. While the beef is marinading, cut up a carrot and zucchini, tossed it with some olive oil and salt before roasting it in the oven for 20 minutes at 400F. Slice up an onion and some mushrooms and set it aside. Start with a drizzle of oil in a hot skillet and sauté the onions before adding in the garlic. Cook for 2 minutes. Add your ground beef to the skillet. Let the beef cook on medium-high heat but be sure to break up the beef with a wooden spoon so that as the beef browns, it browns evenly. Once your beef is almost finished cooking, add in your mushroom. Add more salt & pepper as needed. Continue to cook until done. Serve with your optional sides immediately or pack for later in your meal prep containers. I've included the carrot and zucchini in the calorie count.